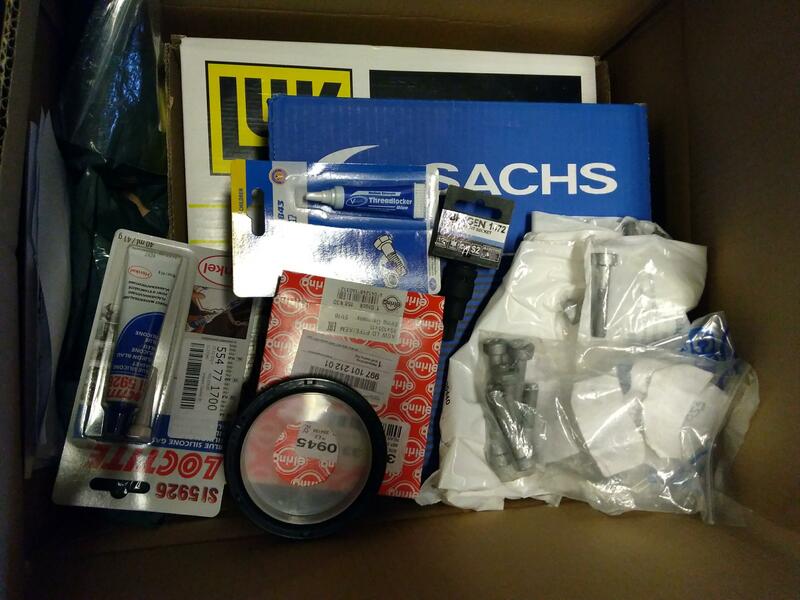 I reached critical mass in my parts hoarding. Something has to give, the parts need to be fitted sometime. No better time than outside in mid winter. I have borrowed a car for the duration, the 996 is SORN. oh and i have fuel filter and waterpump, and belt bearings to go in too. I fear this is going to take a while. More to follow. Step 3 - use cable ties to put it back together and wait until Spring! The problem is that come springtime you want to be driving, not fixing. Ah ye of little faith. I once swapped the gearbox on a 306 so feel I'm qualified for this task. I only get the odd hour to do stuff unfortunately. Thankfully all my brace bar and gearbox mounting bolts came loose, except I couldn't get on the top bolt - this will have to wait as I will drop the engine on its mounts 25mm to gain access. Dirty. Maybe I'll get it steam cleaned when I'm done. Or maybe not. I proceeded to remove all underbody covers and arch liners. 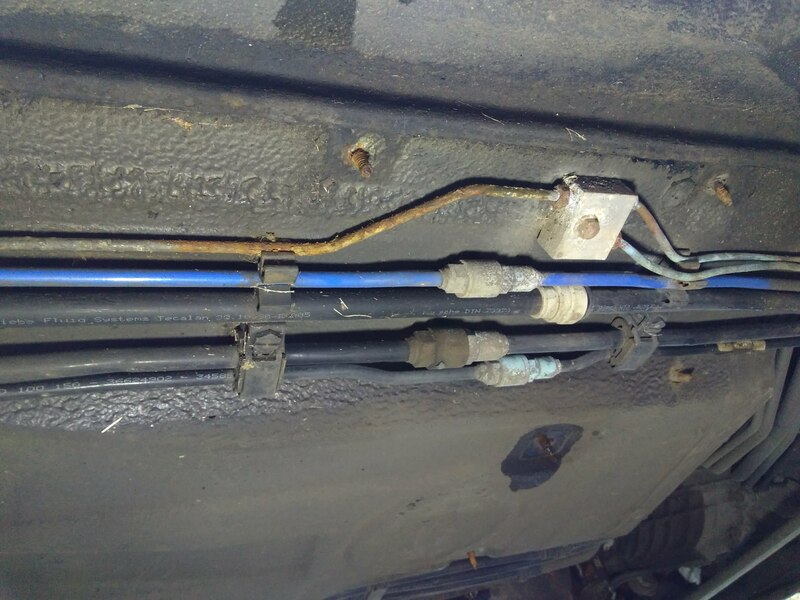 This brake line was hiding, looks OK so will wire brush and liberally waxoil. Someone has been in and replaced the other lines already. 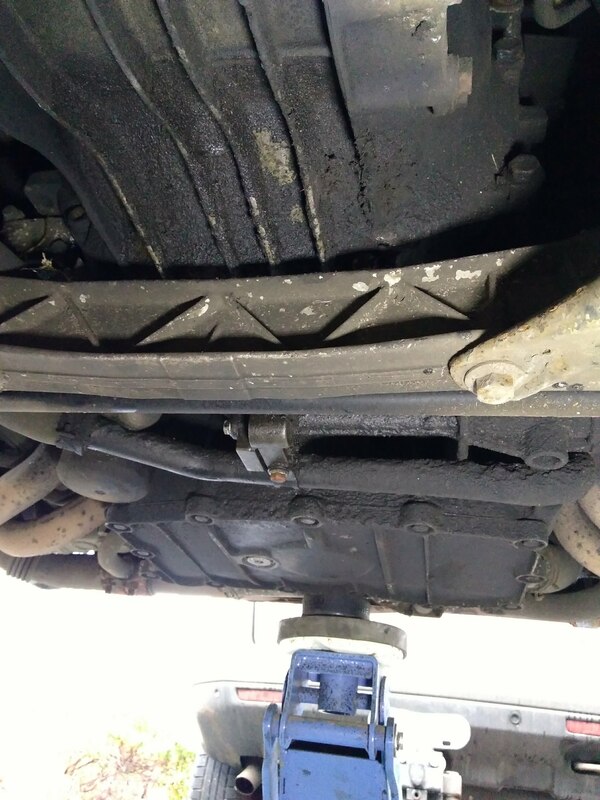 I'd advise you all to remove your underbody plastics and check whats lurking. Next step will be fabricating tools. It could be your IMS seal that is leaking and I'm assuming this is getting the outer bearing seal removed while you are in there? 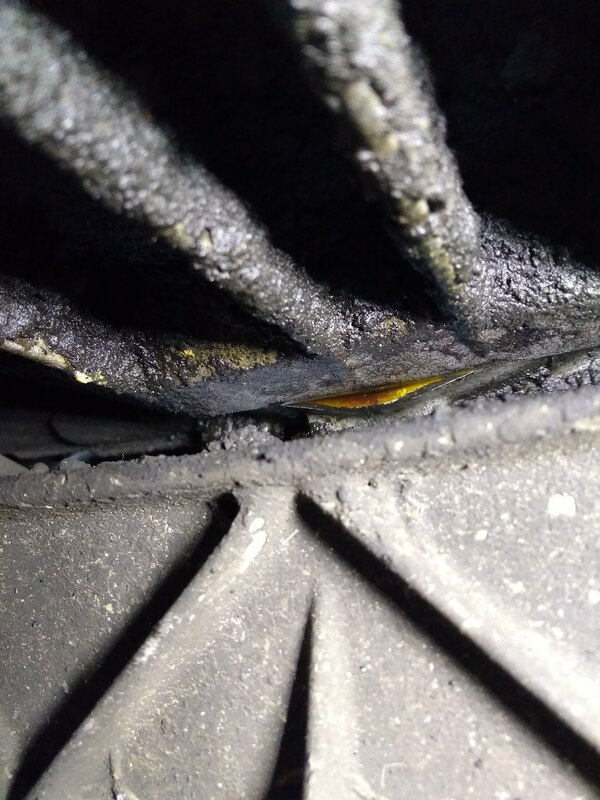 Have a good look at the brake pipe were it goes into the clip as thats the point they rot out .. if in doubt then either replace or cut and join .. ive blown those pipes on road test before and it happens when the car is MOT,ed on the brake rollers due to the excessive force used . 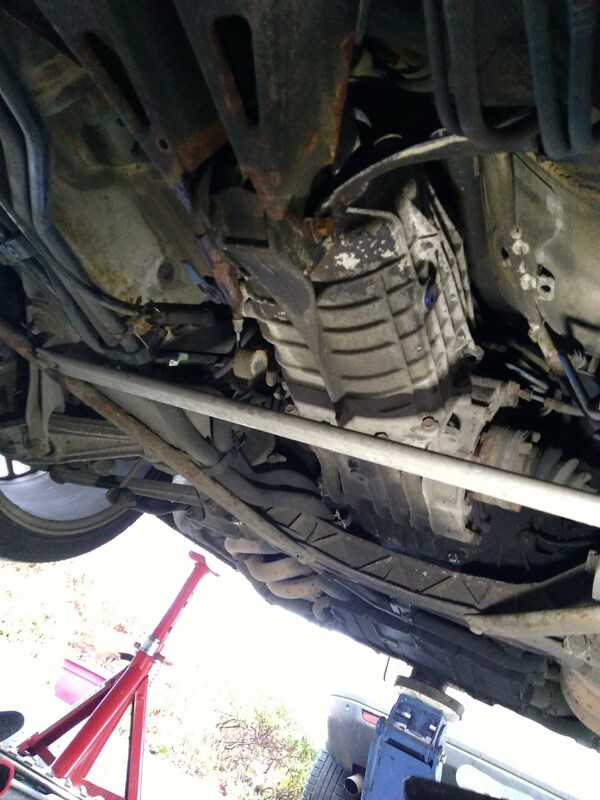 Check the clutch slave cyl pipe and union as they are often heavily corroded these days . Ive seen in our bodyshop they have a tool that you fit a new stud into , press it against where you want it and it will weld it in place so perhaps thats an option as it doesnt take long . Thats not a bad leak IMHO .. i see far worse ! Ive not done this in a few years now but im sure there was x2 bolts going sideways in the caseing that when you do ims / crank seal you also replace as they can leak . A question for you guys .. how do you fit the crank seal without the tool ? Personally I use the old seal backwards and a piece of wood to drift it in a circular motion. Yes I'm going to check the bearing for play and flip the seal off. Thanks a lot for the tips Demort! I will make 2x of these each from 2 pieces of 2mm steel cut and glued together. While I wait for steel to arrive to make my jack attachement and camlocks I got on with some "easy" jobs - spark plugs and fuel filter. I say "easy" as they are both a bit of a wrestle. The car has FULL service history by OPC and VERY respected indies until I got my hands on it at 111k miles. Thats why I hadn't changed it yet. At its OPC service on 14/01/05 the car had 33479 miles. The car has 100k miles more than that now.....the fuel filter is probably 100k miles old. They should be changed every 60k. None of people who serviced it in the meantime thought to change the fuel filter, despite ticking the "major service" box in the service history. This is why I service my own cars. I love threads like these even though I have no plans / skills / patience to carry out the tasks shown. That sounds easier than sourcing 100mm plumbing. (UK is 110mm). I'll give it a bash (!). I understand the depth has changed a few times, is the latest 15mm from flywheel mounting face? 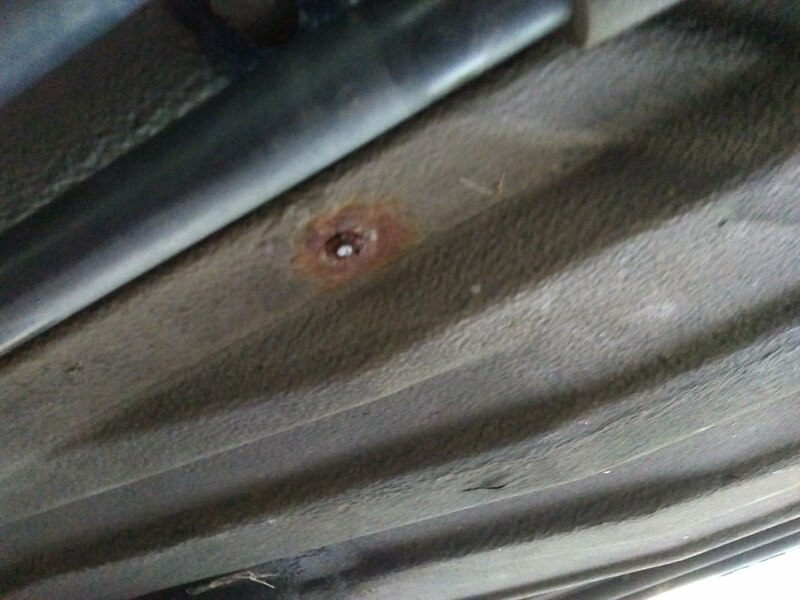 And what if any sealant do you use (I noticed on Marky911's they used some red sealant on RMS and IMS seal, and yellow on the threads of the IMB cover bolts). So do I, love watching others do the jobs! Now its my turn....Thanks for the encouragement! I just have it in about 0.5mm from the casing face, there is a figure but I don't have it to hand. Don't use any sealant and you need it to be oil free too. Just be patient and get it straight. 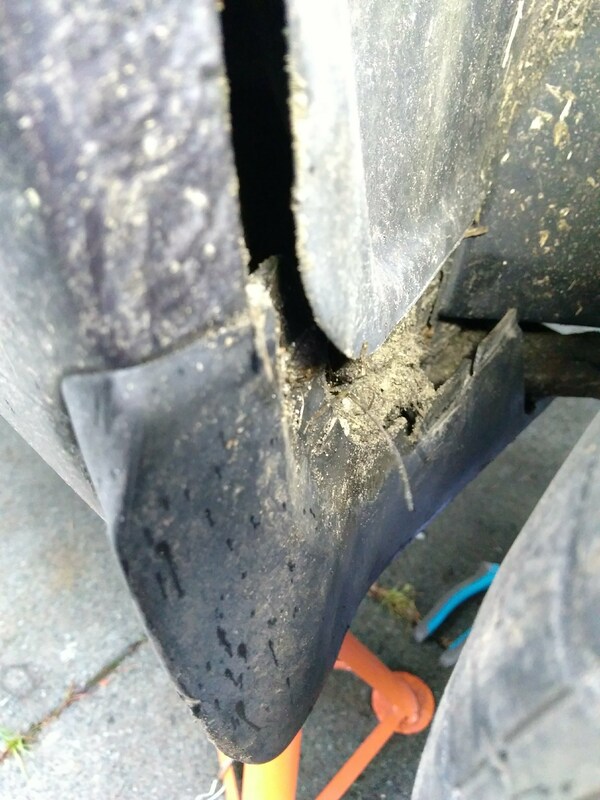 Using sealant actually lubes the sidewall of the seal up and can slip out by itself. The latest RMS design is the best and will seal fine. The IMSB cover bolts go straight through into the hollow casing so use thread lock on them. Go on Wasz!! You glutton for punishment. Regarding the sealant. My Indy once had an IMS seal that must have been faulty from the factory. He fitted it and got everything built back up and finished. It leaked after a short time so he had to do it all again, hence the sealant. It doesn't go on the proper IMS seal. You let the seal do its job on its own. The sealant goes behind the seal when it's almost in. It's just a belt and braces option, so if you do ever get a weep from the seal the secondary barrier should stall it for some time. I'm happier with it added but some, like infrasilver aren't. That's fine, it's just personal preference. Same with the bolts. If you look at the new bolts in one of my IMS cover pics you'll see a substance on the threads. That's a thread lock/sealant from Porsche. Again you let that do its job and add a bit of liquid sealant just under the heads as you tighten them up. Again personal choice but seems sensible to me. Good luck buddy. I would hate to tackle that lot on the floor. I'm sure you'll manage though. Watching with interest. PS. I see you mean RMS too. No sealant on that as I far I'm aware. Clean and dry as Infra says. No sealent on an RMS .. hard to say on the IMS .. i have and havent over the years but neither way caused a problem. The 13mm nut .. put sealent under it and on the threads , if the O ring seal on the shaft gets damaged then that will seal it . RMS seal placement .. basically anywhere that is in a different position from the last one .. you will see a wear mark on the crank when you remove it so 1 mm away from that is fine . The seals and placement have changed so many times over the years though its hard to keep up ..Leaks here are Porsches achilies heel i think . The tool for the RMS puts even pressure on the seal to slide it in .. i have many years ago got it slightly off and it damaged the seal as it was pushed in . Basically be care full not to push it to much side to side and if you see any rubber coming off the seal then fit a new one as thats what happened to me. 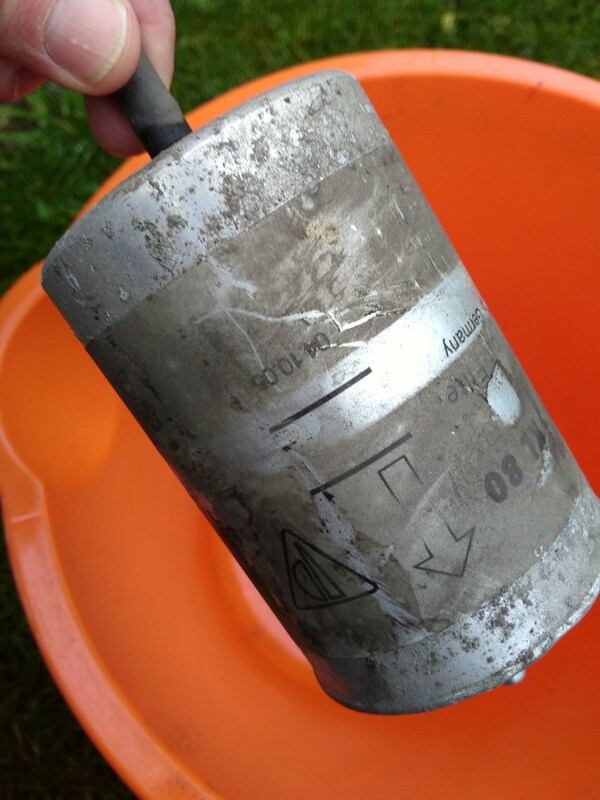 Fuel filter .. yup im not suprised im afraid .. something like 2002 ? they stopped having a fuel filter .. its always been an option like plugs , brake fluid etc and it gets missed by the service advisors .. mechanics tend to do what it says on the job card ..
Ive questioned why a major with no Brake fliud change .. with out plugs etc many times only to be told it was done as such and such or not needed so we kinda give up asking .. Sorry for that ... i try harder these days at an Indy though . Also at OPC i was on a set time for a service .. not nice to get told your not fast enough every month at the apprasial so you tend to do what your told .. again sorry for that . Im nothing if not honest .. it will be the death of me i swear !! 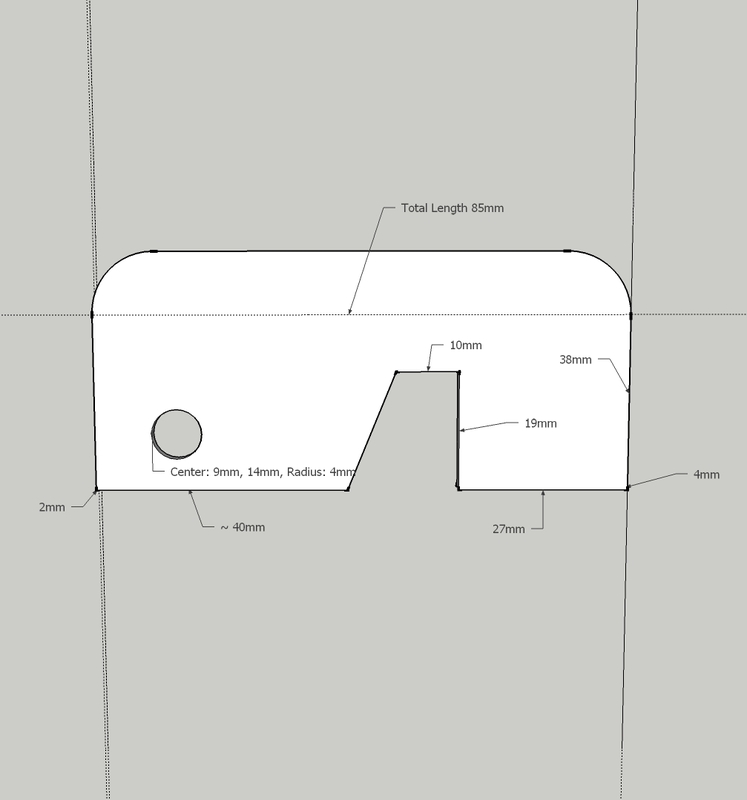 Isn't cam locking tool 6mm thick? I know it is for the 3.6 as I used to make them. 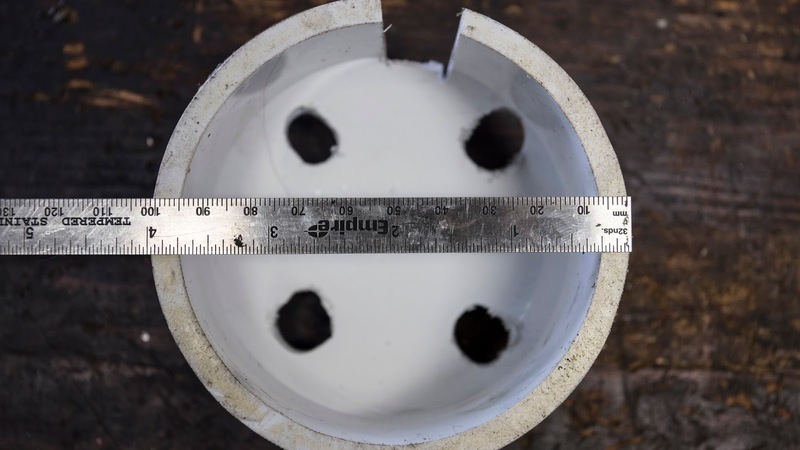 If so, you might want to use 3 pieces of 2mm plate. Edit: Although I suppose if your 2mm offset (step) is correct, then one face of the cam slot will sit flat against the tool.